I woke up really late last night just before midnight and I felt really good. I felt human again and so I probably over did it a bit. 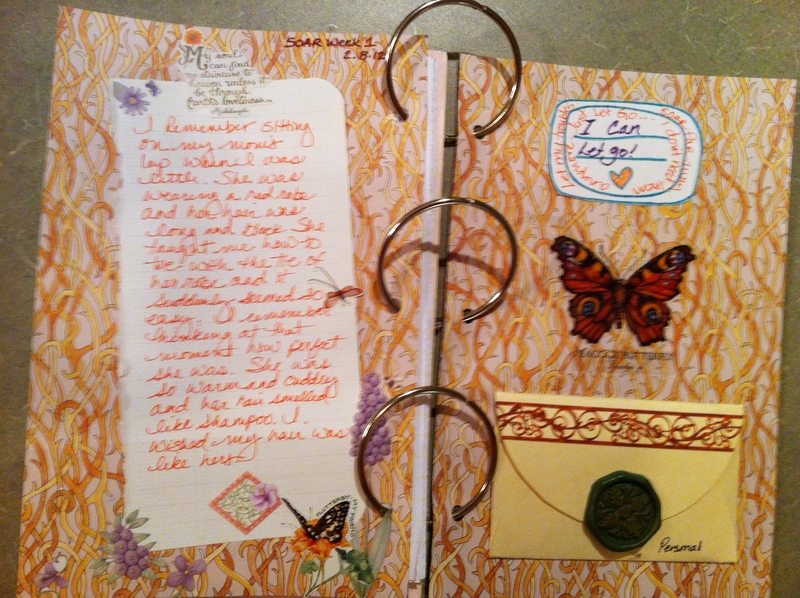 I cleaned up some and then worked on my SOAR Journal. My printer is out of ink so I haven’t been able to print the nice graphics that Anita has put together for us to use in our journals. I had read the first lesson already and had been brooding on it a while. I went into the garage and pulled out my tubs of scrapbooking stuff and went to work. I’m glad to actually use some of that stuff. I bought most of it years ago when a place was going out of business so I got a really good deal. Later I discovered that I did not enjoy scrapbooking. I do enjoy making cards but most of the things I bought were going unused. 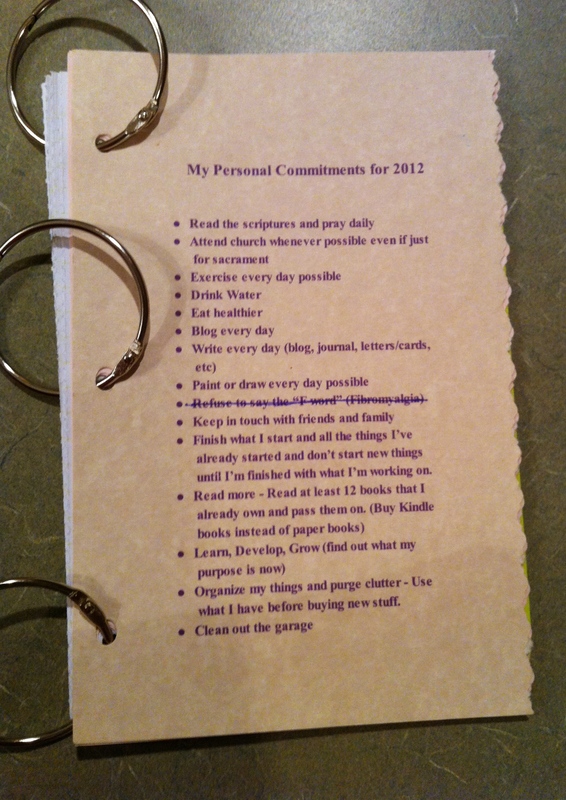 Back in January I printed up these sheets with my list of personal commitments and my To-Do list for 2012. 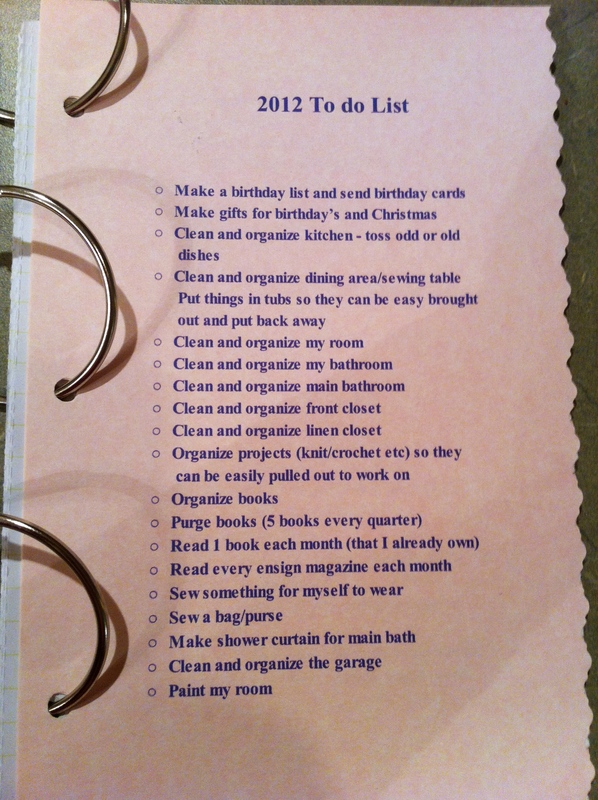 The To Do list is actually two pages. I hope I can get most of them done if not all. 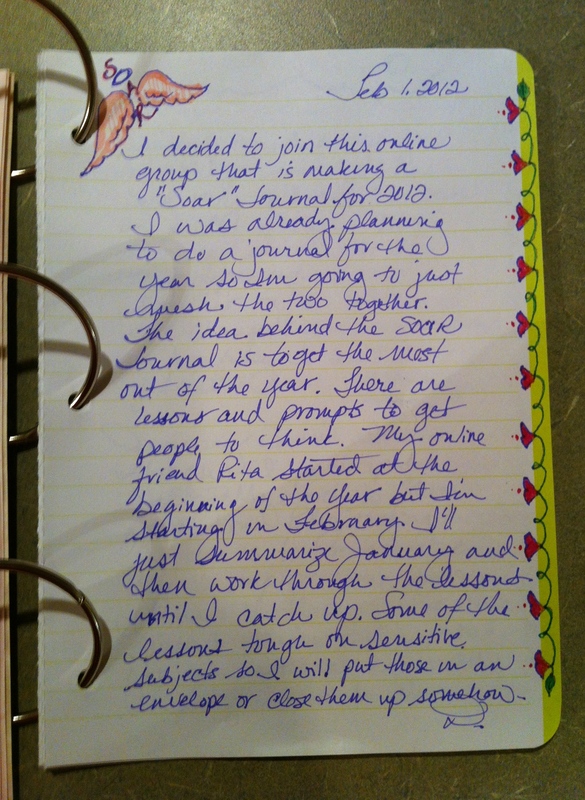 A few days ago I summarized the month of January and added those pages to my journal. I’m just making the pages half sheets of paper, hole punching them and connecting them with loose binder rings. The lined pages are from a journal I have with a scary frog on the cover. 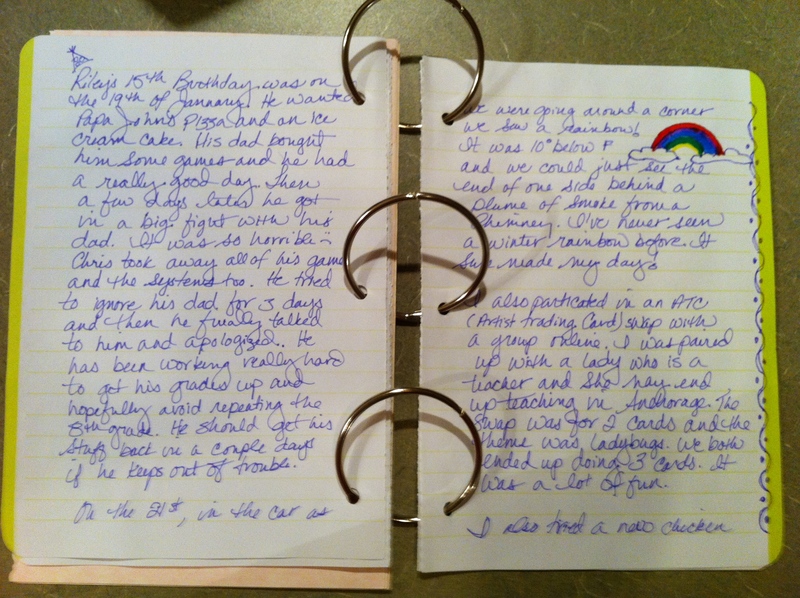 The pages are just the right size for my journal and they are perforated so they come out with a nice clean edge. The pages were a bit thin so I did put two together to make them stronger. I haven’t made the covers for my journal yet but eventually I will. Right now with so few pages the rings look so huge but after a year I’ll bet I’m glad I got the big rings. On these pages I just doodled a bit as I wrote. I was surprised I had so much to write about for the month of January. 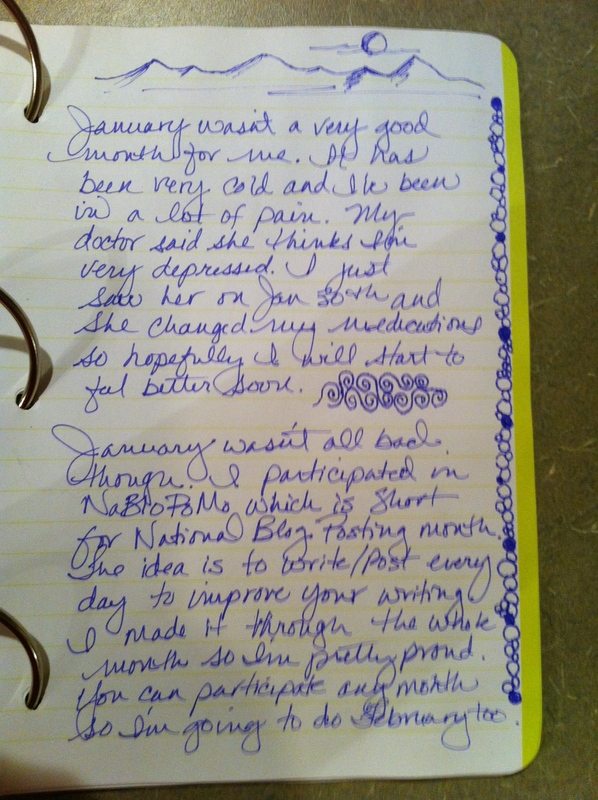 I really had a hard time dealing with so much pain in January that I thought it would be sad. I reread my blog posts before writing this and was surprised at how much I actually accomplished during that time. Just imagine what I can do when I feel good! I’m not showing all the pages; There are probably 6 or 7 pages. It really was fun working on them though. Last night I worked on a two page spread for lesson 1. My scrapbook pages are for 11×11 scrapbooks so I had to measure and cut them out. Lesson 1 was a tough one for me since it was about letting go of something that has been holding you down. I have a huge thing that I have been fighting with for 20 years and I really wanted to work on that. I’ve been trying to forgive someone for a long, long time and so far I haven’t been able to. I think I got somewhere with this though and getting to talk to Anita about it has helped a lot! She is the one running the group and she can relate to what I’m dealing with. I ended up writing a letter to the person that is not meant to be sent and then I made an envelope out of an old folder that I added to my journal. That way anyone who flips through my journal wont see my very, VERY personal note. The other part of the first lesson was to bring you back up after thinking about something so sad for a while. I wrote about a memory I have of my mom teaching me how to tie with the belt of her robe. This picture is a bit blurry. My tremor was really bad at the time. You can see I did use one of the graphics that came out of my printer with a faint line. I used markers to trace it and used it anyway. There are a few others that I might do that with as well. Anyway, now I’m ready to work on Lesson 2. When I got done working on that I suddenly realized I was burning up. I took my temperature and my fever was back. I took some Dayquil and went to sleep. Believe it or not I can’t take Dayquil and stay awake. My husband and even my teen-aged kids can take Niquil and stay awake if they need to but I konk out after just taking Dayquil. So I never got a chance to make a love note for today but I’m going to make up for it by making two today. 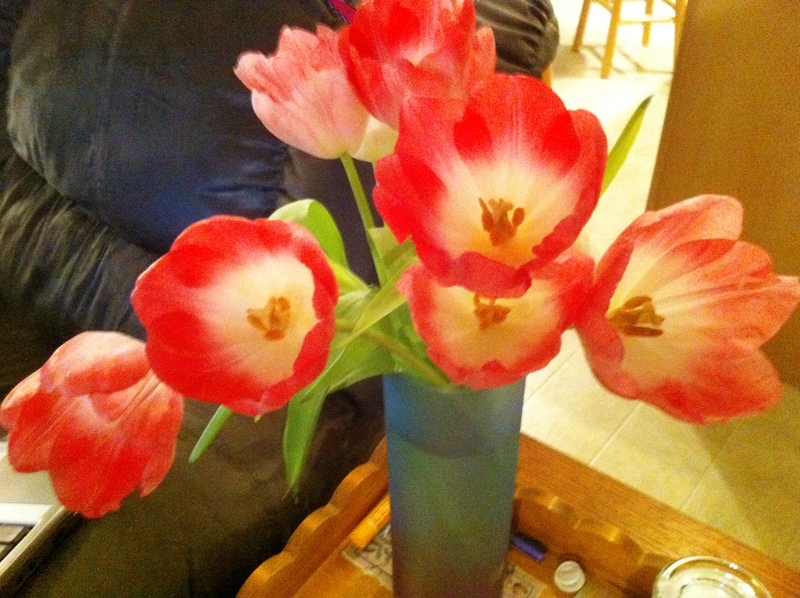 Here is a picture of the pretty tulips my husband bought me. 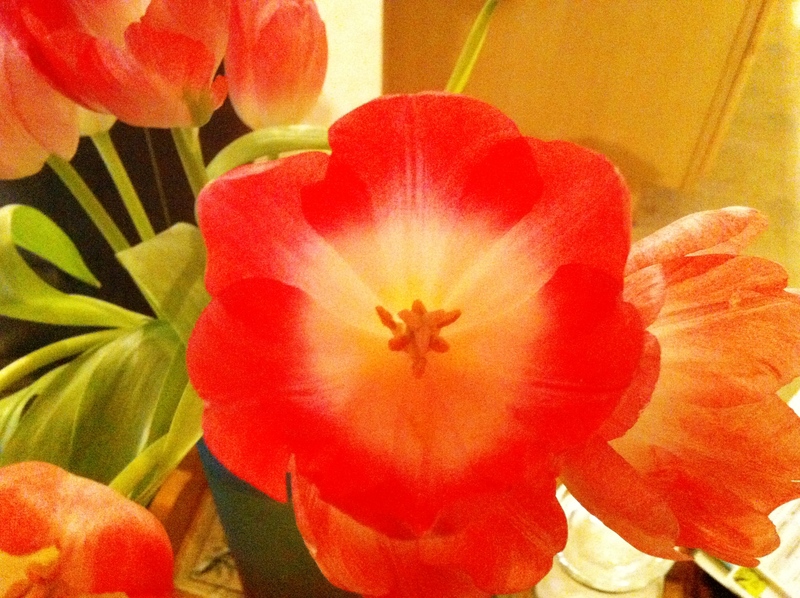 The iphone always warms up the colors so these tulips are really a very cool pink. I remember when you bought the scrapbook stuff!